Before you start reading, there’s one simple question you need to answer: do you genuinely love and get on with dogs? We’ll assume the answer is yes, otherwise there’s no sense in you reading any of this! If you can honestly answer yes, without reservations, setting yourself up as a dog walker can be a great life choice. You can forget about office politics and having to be polite to a boss even when he/she’s an absolute moron, and you can choose when and where you work, pick and choose your customers and get as much fresh air and sunshine as you want. Well, perhaps not the sunshine bit, given that this is the UK we’re talking about! Obviously, being your own boss, even as a professional dog walker, isn’t all ice cream and deckchairs in the park. You need to build up a good-sized customer base and that doesn’t happen overnight. At least to start with, you’ll need to take whatever customers you can find, while you build up your reputation and customer numbers, but once you’re established, working as a dog walker can be a brilliant choice. If you take newspaper stories at face value, dog walkers earn up to 20% more than the average UK salary despite working half the hours, but that depends on you. Almost all dog walkers aim to walk dogs in groups where possible, to maximise hourly earnings. The average rate of £11.50 may not sound too much, but if you walk 4 dogs at a time, that’s £42 an hour. If you do that 3 times a day (so 12 dog-walking hours a day) that’s £126 a day. If you only walk on weekdays and work an average of 20 days a month, that’s £2520 a month for working 60 hours a month, or £27,720 for an 11-month year (we all need holidays). Even then, it’s not entirely correct. ‘Walking time’ is only part of the picture. You also need to collect and drop off dogs, which might take one or maybe two hours a day, and when one of your charges inevitably does a bunk, you might spend a couple of hours tracking him or her down again. For that reason, many dog walkers invest in GPS locators, which they attach to all their charges whilst they’re out and about. You’ll also need to look into insurance – you are legally responsible for the dogs in your charge (think kids getting bitten, dogs causing traffic accidents and so on) so you’ll need to look at dog walker insurance too. It’s not hard to find and not terribly expensive, but more or less compulsory. Also, if house-owners give you the keys to their house, they’ll almost certainly require evidence of insurance and a clean criminal records check certificate too. The maths is undeniably attractive, but to achieve a decent level of earnings you’ll need to find and keep a constant number of customers – let’s say a customer base of 25-30 to allow for occasional customers, dogs that are only walked a couple of times a week and so on. It’s not simple, but it’s quite easily achieved if you plan and market yourself properly. No matter what kind of business you run, your success will be almost entirely down to how well, or badly, you market yourself. Relying on postcards in the local newsagents or trying to sell yourself on Facebook is all very well, but it’s better to do things properly. It has often been said that having your own website is like having a personal sales representative who works 24:7, and it’s true. A website doesn’t need to cost too much, but for god’s sake avoid cheap and nasty “free” websites that shout ‘amateur’ and very rarely show up in Google searches. You might pay a couple of hundred pounds to get a site professional built, but it’s worth the investment. Next, find places where you can promote your website and other places where you can advertise your services. Yes, registering with forwalks.co.uk is a good start! Find websites that you like, websites where you might go to look for a dog walker, and add yourself there. As it’s free, post articles on social network sites to tell people about your website (and services). For example, share your website in Facebook posts and ask your friends to like and share them. None of this will work on its own overnight, but the combined effects will benefit you in the longer term. 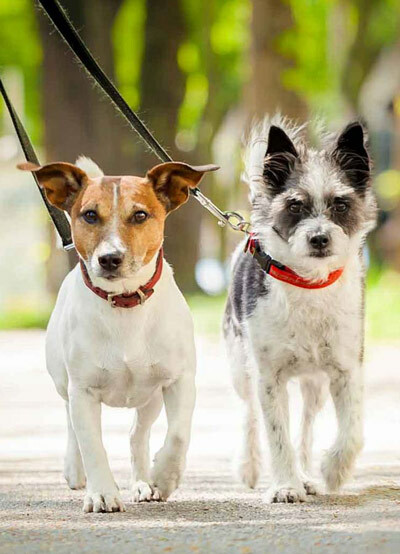 If you don’t fancy running your own business, there are plenty of dog-walking agencies who employ dog walkers, either as employees or as freelancers. You won’t earn as much, but you won’t need to spend time thinking about how to market yourself.